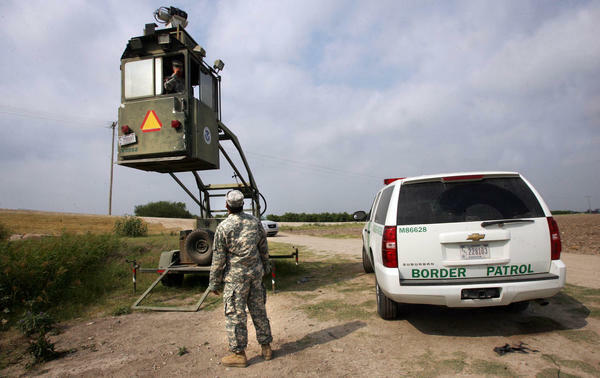 A member of the National Guard checks on his colleague inside a Border Patrol Skybox near the U.S.-Mexico border in Hidalgo, Texas, in 2011. President Trump is calling for troops on the Southern border, something the past five presidents have all done on a limited basis. President Trump signed a proclamation Wednesday for the deployment of National Guard troops along the Southern border with Mexico in a bid to cut down on illegal immigration. Kirstjen Nielsen, secretary of the Department of Homeland Security, said earlier in the day that Trump's order would direct her department and the Pentagon to work with governors of the states along the Southwestern border. Speaking at the White House, Nielsen said, "Our current border security and immigration laws fail the American people. The system rewards bad behavior. It does not punish lawbreakers. It undermines our nation's economic interests." She said the National Guard troops would be deployed as quickly as possible and gave no indication of how long the mission might last. Asked how many troops would be involved, Nielsen declined to give a number, saying, "As many as is needed to fill the gaps today." The DHS's Customs and Border Protection reported Wednesday that apprehensions of people entering the U.S. illegally at the Southern border jumped by 37 percent in March from the February level, and by 203 percent from March 2017. Trump indicated Tuesday that he wanted the troops to secure the border. "We're going to do some things militarily," Trump said. "Until we can have a wall and proper security, we're going to be guarding our border with the military." "That's a big step," Trump continued. "We really haven't done that before, or certainly not very much before." However, the move actually has many precedents. Every president since Ronald Reagan has called on the National Guard for limited, temporary missions along the frontier. The troops have been used primarily for surveillance and other support activities. Troops are forbidden to conduct civilian police actions, such as detaining suspects and using force, under a law first signed by President Rutherford B. Hayes in 1878. Trump's remarks on Tuesday appeared to catch many off guard — including the military. Here are some of the questions raised by the president's comments. 1. How have presidents used troops in the past? In 1986, Reagan declared drug smuggling a national security threat and launched a multipronged approach that included the National Guard as well as several law enforcement bodies. He also signed a bill that provided amnesty for 3 million migrants who had entered the U.S. illegally. His successors, including George H.W. Bush and Bill Clinton, have all called in the troops. George W. Bush deployed some 6,000 National Guard troops in 2006 for what proved to be a two-year mission, assisting the border guards with both undocumented immigrants and drug smuggling. Barack Obama ordered a similar, if somewhat smaller, operation, in 2010. Around 1,200 National Guard troops were called up initially. By 2012, the numbers on the ground were scaled back and a greater emphasis was placed on aerial surveillance. 2. What is the current situation on the border? After rising for decades, illegal immigration dropped after the 2008 recession that resulted in a sharp decline in economic opportunities. In addition, the Obama administration deported more than 2 million undocumented migrants, more than any other president. The Obama administration focused primarily on convicted criminals and those apprehended shortly after coming across the border. Illegal immigration took another downturn when Trump assumed office last year with his promise to crack down on illegal immigration and build a border wall. 3. So what prompted the president's decision to call on the National Guard? While illegal immigration remains at a low level compared with in past decades, there has been an uptick in recent months, according to figures from Customs and Border Protection. "The numbers we're releasing for March will indicate a staggering increase from last year," said a senior administration official during a conference call with reporters. "As of last April, we were at historic lows," the official said. "We are no longer at that point." Critics say the president is acting more out of politics, noting that the $1.3 trillion spending bill he signed last month did not include the billions he wanted to build a border wall, a fundamental campaign pledge. 4. How much authority does the president have? The role of the National Guard or any other troops is limited by the Posse Comitatus Act. President Hayes signed the measure in 1878 with the intent of ending the law enforcement role that federal troops were carrying out in the former Confederate states. The troops were supervising elections, chasing down criminal suspects and looking for illegal whiskey production. The law, amended most recently in 1981, does permit the military to do things like help out on U.S. soil in the aftermath of a natural disaster. When it comes to the border with Mexico, this has meant providing surveillance and other support roles. However, the military cannot act as a police force and make arrests or use force. Texas Gov. Greg Abbott said Monday that a small number of Texas National Guard members would remain on the U.S.-Mexico border, where they have been for the past three years under his authority, conducting surveillance. They will begin taking federal orders this month, he added. About 100 service members will remain in the border region, The Associated Press reported, citing Lt. Col. Travis Walters, a spokesman with the Texas Air National Guard. 5. How is Mexico reacting? The Mexican ambassador to the U.S., Gerónimo Gutiérrez, said his government has asked for clarification from the Trump administration. "It's certainly not something that the Mexican government welcomes," he told CNN. In an interview with NPR on Tuesday, Gutiérrez said, "We're trying to find the best ways to manage migration flows in a way that it's respectful both to the laws of the United States and Mexico." He also said most migrants reaching the Southern U.S. border are "no longer Mexicans; they are Central Americans." The immigration issue is a hot-button topic in Mexico's presidential campaign. The leading candidate, Andrés Manuel López Obrador, said this week that "Mexico and its people will not be the piñata of any foreign government." As the crowd jeered at the reference to Trump, López Obrador added: "It's not with walls or use of force that you resolve social problems."